Hola! Today we’re bringing you a family recipe from Cuba. And with good reason. OK, a couple of good reasons. 1) They are delicious, bite sized and can be enjoyed in moderation; and 2) Stacey is going to have FREE samples of them at her art show opening, and if you’re in the D.C. area, you’re invited! But first things first, what are pasteles de guayaba? Smash one bar of margarine or butter with a fork or with the paddle in the stand mixer. With its wrapper, grease an 8×8 pan. (The recipe can be doubled for a 9×13 pan.) Bit by bit, add in 1½ cups of sugar and mix well. Add in 2 eggs and a teaspoon of vanilla. Add in 2 cups of all-purpose flour (or 1¼ cups AP flour and ½ cup of whole wheat), 1½ tablespoons of baking powder, one teaspoon of salt and mix well. Wet your hands and take about half of the batter out of the bowl and mold it into one layer in the pan. 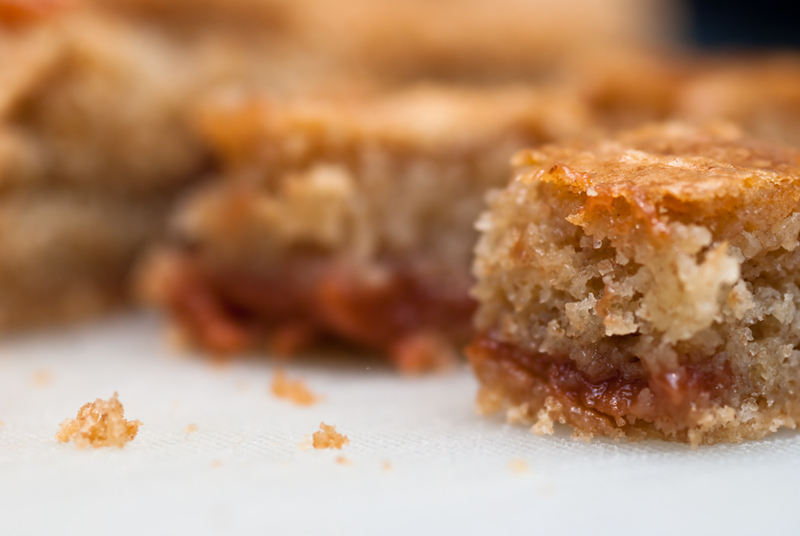 Take the can or bar of guava paste (we like Goya brand, but we’d love to find a no-sugar-added version) and make one layer of ¼ inch strips of it. It takes about half of the can to do so. Then wet your hands again and layer the other half of the batter on top. Bake at 300 degrees Fahrenheit for about an hour, until the cake is cooked through. Cut it into bite-sized pieces once it has cooled completely. We like to put them in freezer-safe containers and eat them one-by-one for weeks or have them on hand to bring to parties. Too sweet a treat? If you enjoy experimenting with your baking, try a sugar substitute like Splenda or use part or all whole wheat flour for an added whole grain boost. Let us know how that impacts the taste and enjoyment of some of your favorite baked goods and sweets. We’re curious to hear what ideas have worked for you. If you like the “real deal” when it comes to sweet treats, it’s as easy as 1 – 2 – 3. 1: What do you really want to eat, and why? Use your hunger and appetite cues. Be mindful of some possible reasons for making the choice – physical hunger, boredom, celebration, because it’s there, etc. 2: Consider your calorie budget for the day to determine the appropriate portion. A small taste of what we really want can go a long way in terms of satisfaction. 3: Enjoy! Food is fun and eating is a delightful experience. Finally, remember that art show we mentioned? Stacey printed several photos of Puerto Rico and documents how her life – and that of her family – changed when she married into the Puerto Rican culture. More information, including her statement about the show, can be found on the Boricua by Marriage blog. Stacey made a ton of pasteles de guayaba, so come sample one at the show on Friday, May 29th! And it could turn into a “Meet the Bloggers” event, too, as Sam will be at the opening! How Stacey Got the Shot: At f/5 in 1/60 of a second, with the flash bounced off the ceiling. The 105mm macro lens helped make this a beautiful shot. Wish I lived closer so I could go to your art show. Good luck! I marvel at your photography.